What comes to mind when you hear the word Starbucks? A warm cup of coffee, or the green lady who decorates the company’s products? This isn’t any lady, but a siren—a temptress that has been depicted in art and literature for millennia. In the European Middle Ages, the siren was the enchantress of the illuminated book known as the bestiary. The bestiary was a compendium of real and imaginary beasts from the Middle Ages in which each animal acted as a vehicle for Christian teaching. While the siren may not be as well known a beast as the unicorn or the dragon, she has her own unique charms. Sirens are half woman, half bird, with a sweet melodic voice that beguiles sailors from afar. By the seductiveness of their voices, the sirens entrap and kill incautious and unmindful men. The moral? Fall for the beautiful and ostentatious, and you shall be damned. Images of sirens in medieval bestiaries also fool the eye. 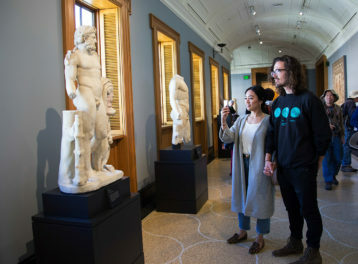 Portrayed as beautiful hybrid animals, playing with their long lustrous hair and gazing into a mirror, sirens do not strike us as deadly beasts. Even non-human creatures—like the centaur in the illumination above—are captivated by their charm and beauty. 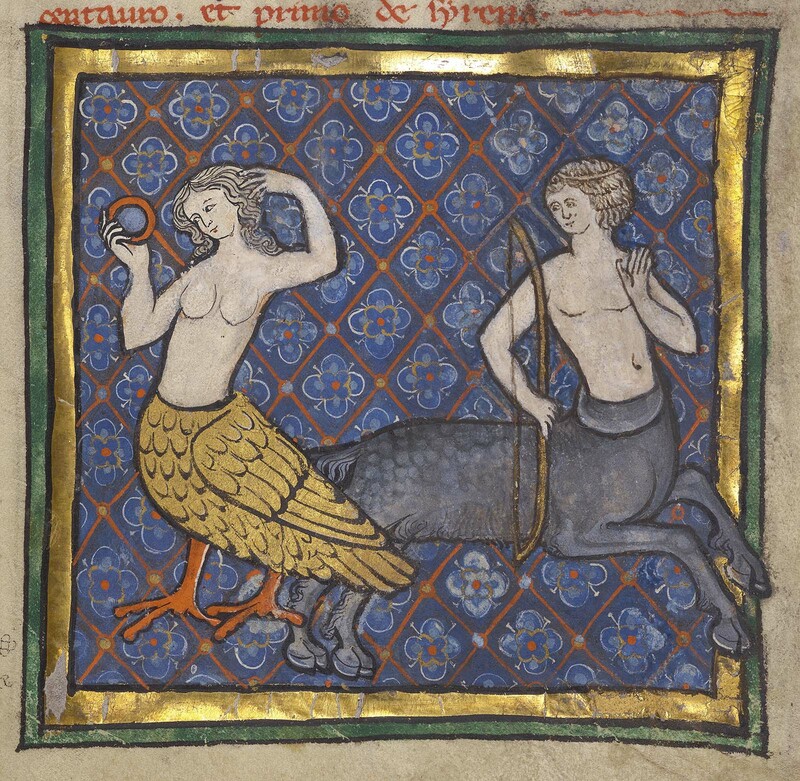 Most sirens in bestiaries are bird-women, but not all. Some are male, and others are part fish. A distant cousin of the mermaid, perhaps? One such example comes from the thirteenth-century illuminated manuscript known as the Northumberland Bestiary. The artist portrays three sirens as human from head to waist and as fish from waist to feet, with the wings of a bird and the webbed feet of an aquatic animal. 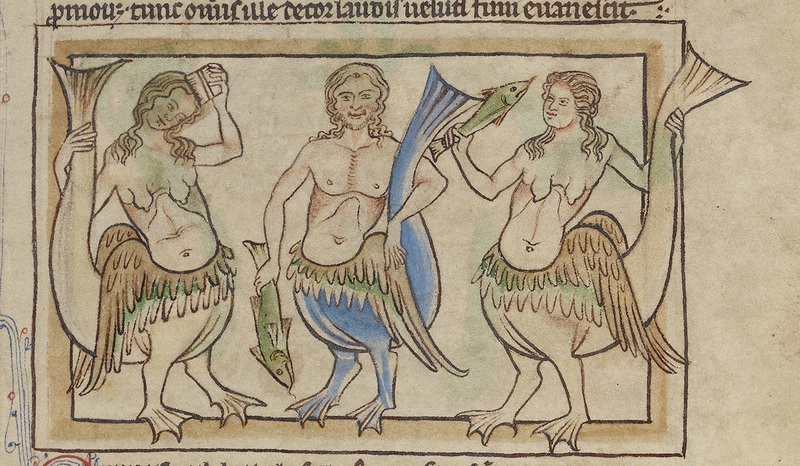 The female siren at left combs her hair; the male siren and the other female siren hold fish, the Christian symbol for the human soul. Are the the sirens just grasping their meal? Or is this a cautionary tale about souls lured to their doom? The lore of the siren as temptresses and bearers of lethal melodies derives from Homer’s Odyssey, and sirens appear on painted vessels and sculpted ones dating back to the 600s BC. Sirens are described as possessing fish tails as early as the seventh century, recalling images of mermaids that now dominate popular culture. In both classical and medieval art, sirens lure their prey to their deaths by means of their sweet melodies, live by water, and were regarded as sea nymphs. Because the siren dwells in the realm of the ancient and medieval imaginary, it may be tempting to laugh at the implausible beliefs of the past. But think: the next time you purchase a product with a she-nymph logo, could it be the work of the siren luring you? Barakat, Robert A. 1969. “Wailing Women of Folklore.” The Journal of American Folklore 82 (325): 270–72. Clarke, Willene B. 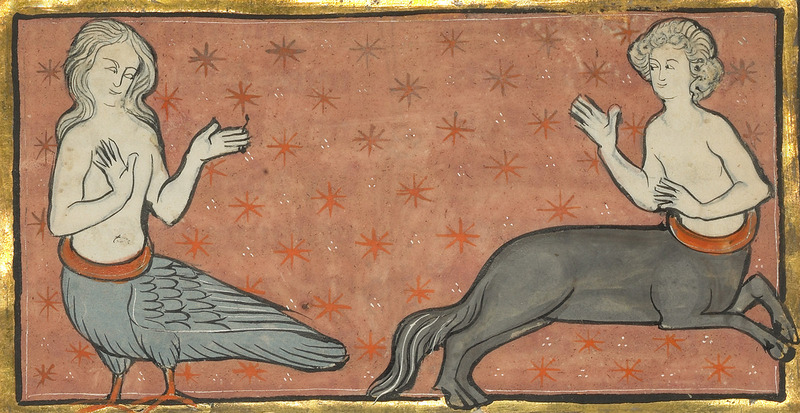 A Medieval Book of Beasts: The Second-Family Bestiary: Commentary, Art, Text and Translation. New York: Boydell & Brewer Ltd., 2006. 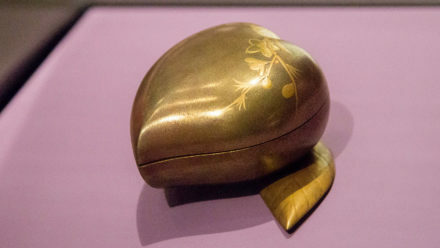 Mustard, Wilfred P. 1908. “Siren-Mermaid.” Modern Language Notes 23 (1): 21–24. Waugh, Arthur. 1960. “The Folklore of the Merfolk.” Folklore 71 (2): 73–84. White, Cynthia. From the Ark to the Pulpit: An Edition and Translation of the “Transitional” Northumberland Bestiary (13th Century). Louvain-la-Neuve: Institut d’études médiévales, Université catholique de Louvain, 2009. Text of this post © Beverly Tandjung. All rights reserved.